I’m sure many of us know at least one story about chicken rescue and we all have our reasons for rescuing or not rescuing. Some of us might go out of our way in search of a chicken needing help and others have an ability to be in the right place at the right time. One thing I have learned a lot about from actual rescue situations is how not to keep chickens. For about 10 years two friends and I ran an ad in a local paper offering our bird rescue services to the community. The three of us love birds of all kinds and felt this would be an opportunity to help birds and learn more about the many species. I was the only one of the three living out in the country with plenty of room for a chicken rescue. After a quarantine period most of the hens would join my resident free-range flock supplying our home with most wonderful eggs of all different colors. I was fortunate to be able to help chickens of many breeds and get to know my favorites. (For the record I have to say that Americaunas are my most favorite. Well, I thought I’d heard of most breeds, but I’d never heard of “Dorkings” before, and got a call from a nearby town requesting a chicken rescue of a small flock. I brought a young man with me that helped around the farm and is great at catching chickens. We thought we were prepared. Another thing I learned is that often, when someone calls for a rescue, they are desperate and sometimes the birds are too. We were led to the barn, where, in a dark damp corner pen, lived this little flock of Dorkings. One was dying and the rest were doing their best to hold on. They had wintered in this prison without benefit of sun or a roost, many missing toes from frostbite. They had belonged to a young girl that lost interest in her 4H project, so the mother called us. This was a challenging position to be in, but quite an education. 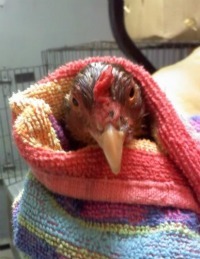 Another thing I learned about chicken rescue is that even when you want to verbally release your anger at the person responsible for allowing them to suffer, the best thing to do is bite your tongue, be thankful you can get them out of there, stay calm and get them home and truly rescued, doctored and into a healthy environment. Generally people are aware when animals are being neglected. Any kind of reckoning with them may end the rescue before you can get the chickens to safety. Sadly the weakest hen passed away as we drove home, but her last moments were spent in the warmth of my young friend’s arms. Chicken rescue can be heart warming as well as heart breaking. The good news is that the rest of the little flock made it with some TLC. There was nothing we could do for missing toes, but chickens are tough and with good care most do very well. 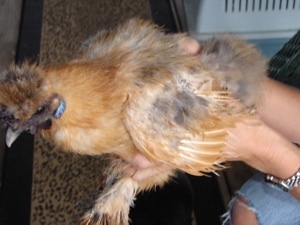 Before rescuing a chicken and bringing it home, it’s important to consider the potential for bringing in disease and parasites, especially if you already have poultry. It would be a shame to try and save a few and make others unhealthy in the process. My wife and I were riding through the country in July, of 2009 interviewing people about the different ways they raise chickens. We were also taking pictures of chickens and chicken coops. On our last interview we met a guy that had loaded his truck with about 25 roosters. He told us he was taking them to the local farm auction. While gathering up more of his chickens to take to the auction he asked if we would like to buy his two year old silky hen (she was about to be loaded up for the auction as well). She was partially featherless and really tired looking. My wife decided then and there that we were going to rescue that hen. We bought Bluebell for $2. Best $2 we ever spent. We brought "Bluebell" home and separated her from the rest of our flock for a couple of weeks. When we introduced her to her new family they would not have anything to do with her. We knew it would take time for Bluebell to adjust to her new life and family but anything is better than going to auction. 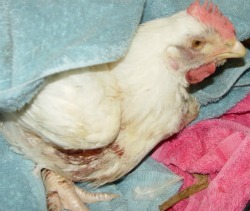 I know this is only one chicken rescue, but it's our rescue and I am sure we will do it again. It makes you feel good to know you saved a life. And you are reminded of it everyday when you see her running around the yard fat, sassy and happy. Bluebell had been doing okay for the last month, but seemed to have a hard time fitting-in with our flock. In the beginning she would come in the coop at night, but stay far away from the other chickens. About two weeks ago, she quit coming in the coop altogether and would sleep under the porch. The porch was low to the ground and I could not get to her to put her up at night. A couple of days ago she was no where to be found. I am hoping she will come back. I pray one of those chicken predators did not get her. We will see. Do You Have A Story About A Chicken You Rescued? If you have ever rescued a chicken, we would like you to share your story with us. Maybe it will inspire others to rescue their own chicken. What Other People Have Said About Their Chicken Rescues. 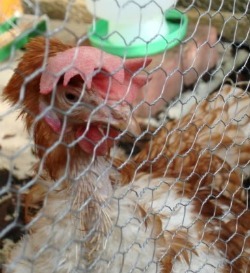 Rescued chicken learns to be a chicken!